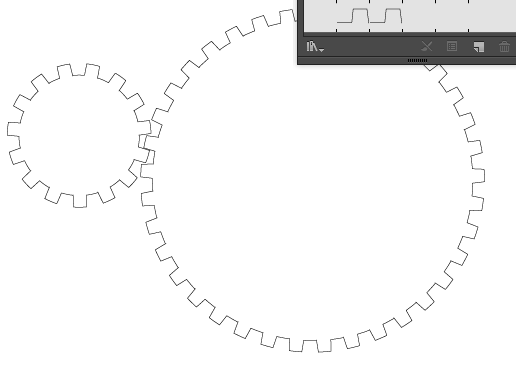 How can I create WORKING gears in Illustrator? I cannot seem to get this right.. 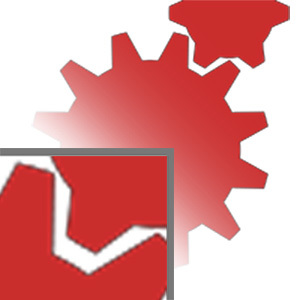 I want to create 2 gears that work together. 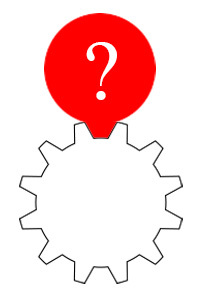 I can create gears, but I cannot seem to figure out the math needed to make them uniform, or where they work together. There is a mathematical way to do this. I do not know the formula..
What I'm trying to accomplish. Create a star with inner radius 200 (400 diameter), 500 (1000 diameter) outer, with 12 points. Compound the smaller circle and star. Intersect the remainder. Do the same thing, except half each value and the points. Alternately, you can draw them by hand --- you just need to use basic geometry to ensure that the diameter of each gear is an integral ratio. I'm not a graphic designer or user of Illustrator, but I am a mechanical engineer. I won't bother going into the details of a properly engineered gear, but just how to get yours to "look right". Your teeth do not have the same depth as each other because you are simply cutting all your dimensions in half. Instead, the bases and tips of the teeth need to be the same distance away from each other in both sizes of gear. The dimension that should be cut in half is the diameter of the "pitch circle". So for the big gear where the two circles are at 600 and 800 diameter, your pitch circle is 700 in diameter with the tips and bases +/-100 in diameter. So your small gear should be 350 in diameter with the tips and bases +/-100 in diameter. Therefore, your small gear should use circles of 250 and 450 in diameter. This may be out of focus for GD.se but i will try to birefly explain this. There are several kinds of gear functions. The most common being the involute of a circle and the cycloid. In principle you could generate a corresponding gear shape pair for nearly any shape but in practice involute has superior properties for misalignment. This is because the pair of a circle involute is a circle involute. 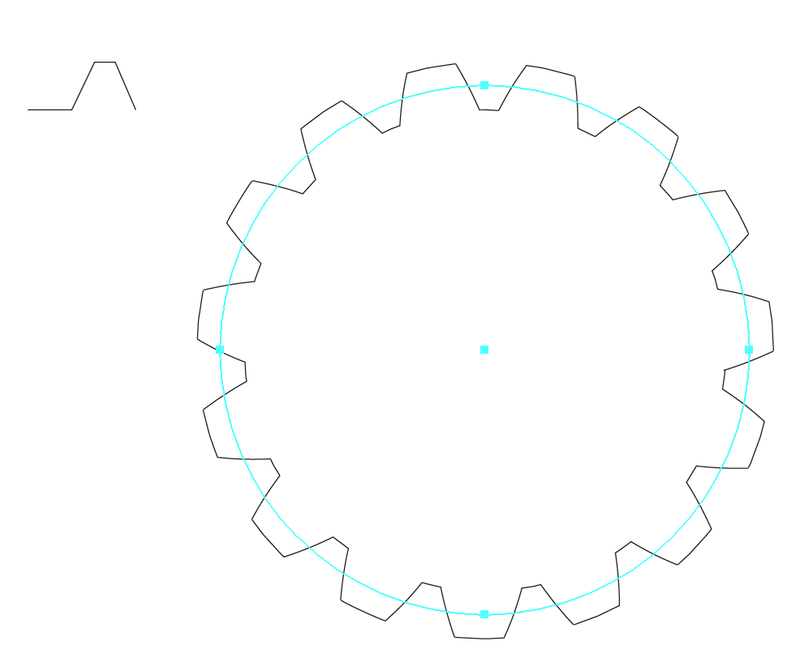 The most common gear shape. Involute gears are by far most common. The involute shape is simply the sum of 2 vectors. Vector one is rotating along the base circle that the curve is the involute of. Vector 2 is perpendicular to this vector and is the length of how far has been traveled on the base circle. Image 1: Formation of the involute shape. Where t is the angle in radians and r is the radius (If you graph 0 to - Pi/2 you get the same image). Okay but this sin itself is not enough. As you need to calculate the shift and size for the mirror of this curve to get the teeth aligned. But this was a very short version of my introductory lecture on the subject. In any case pick a book on mechanical engineering for the really gritty details. How to create line in Illustrator with multiple color segments? How can I create TRON-like glowing effects in Illustrator? How can I create this moire pattern in Illustrator? How to create 3D curve in illustrator? How can I create this warped checkerboard effect on Illustrator/Photoshop?